Obama's Secret Weapon In The South: Small, Dead, But Still Kickin' : Krulwich Wonders... : NPR: These same counties went mostly blue in 2004 and 2000. Why? Well, the best answer, says marine biologist Craig McClain, may be an old one, going back before the Civil War, before 1776, before Columbus, back more than 100 million years to the days when the Deep South was under water. Those counties, as he writes here, went for Obama because trillions and trillions and trillions of teeny sun-loving creatures died there. He's talking about plankton. 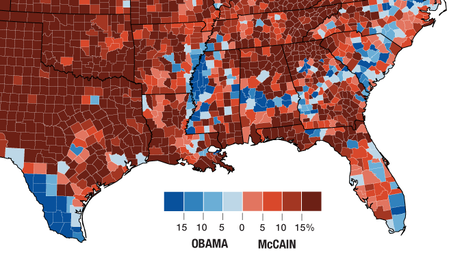 That's why the Republicans can't carry those counties. Blame plankton.